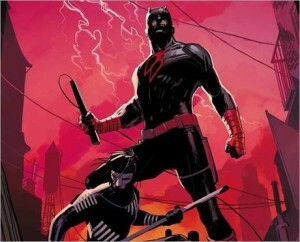 Right off the bat this is definitely not Waid and Samnee’s Daredevil. It’s immediately darker and grittier, in the tone of the story, the dialogue, and most definitely Garney’s art which conveys a real shadowy, Noir feel. Matt Murdock is straight back at it now that he’s returned to New York, rescuing gang informants dropped off the Brooklyn Bridge and working as an prosecutor for the city, so busy that he’s had to pick up a sidekick, Blindspot. Not a lot gets said about this kid yet, but the interaction between mentor and protégé is a pretty cool addition. It’ll take me a couple of issues to get used to this new status quo, but everything in the creative team is working together for a common goal for sure, and that gives me a lot of confidence.